Most gardeners have little trouble growing a bountiful patch of honeysuckle vines. Because of the prolific nature by which honeysuckle thrives, it usually grows energetically and spreads easily. If your honeysuckle seems to be suffering, revive a honeysuckle by boosting the surrounding soil with aged compost. Make sure aphids are not targeting your honeysuckle as well. With a few simple steps, you can renew your honeysuckle and improve its health. Add aged compost to the top of the soil around the honeysuckle. 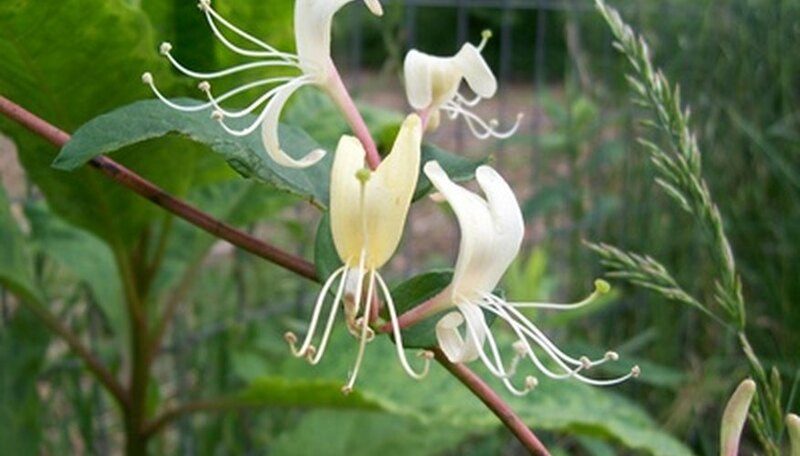 Make sure you do not allow the compost to touch the stems or foliage of the honeysuckle. Lay down approximately 1 inch of compost to the top of the soil. Work the compost into the soil with the hand rake to incorporate it fully into the soil. Water the honeysuckle generously to help the compost seep down to the roots of the honeysuckle. Prune back the honeysuckle to improve ventilation to the foliage. Remove any vines that appear diseased or sickly by cutting them off at the point where they connect with another stem. Discard the stems and foliage you remove. Examine the honeysuckle for the presence of aphids. Look beneath leaves and in areas where the aphids may be hiding and congregating. Direct the spray of the garden hose to the honeysuckle foliage if you find aphids. Make sure the spray of the hose is sufficient to knock the aphids cleanly off the leaves. Repeat the hose spray every time you find aphids on your honeysuckle foliage. Resist the urge to fertilize honeysuckle with chemical fertilizers. Chemical fertilizers will produce an over-abundance of foliage and a lack of blossoms. Aged compost is ideal for fertilizing honeysuckle.